kosambari is basically salad. this kosambari recipe is moong dal kosambari. 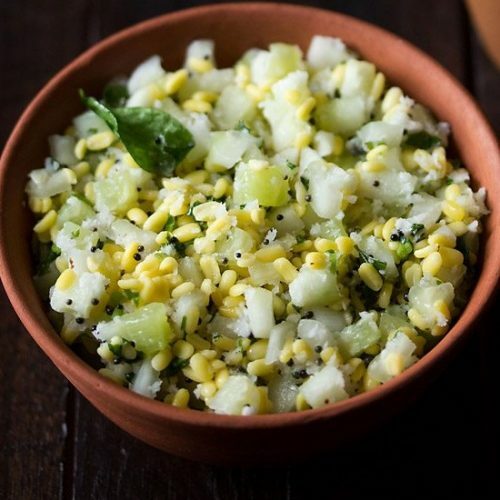 it is a simple and easy to assemble south indian salad. it is also called as koshambari. firstly rinse ¼ cup moong lentils a couple of times in water. then soak the lentils for 1 to 2 hours. if in a hurry, then you can soak moong lentils in hot water for 30 minutes. later drain all the water very well and add the soaked moong lentils in a bowl. add 1.5 finely chopped cucumber, 3 tablespoons fresh grated coconut, 2 tablespoons coriander leaves and 1 green chili (chopped). instead of green chilies, you can use black pepper powder. squeeze some lemon juice. you can add lemon juice less or more as per your requirements. heat 2 teaspoon oil in a small pan and then add ½ teaspoon mustard seeds. let the mustard seeds crackle. keep the flame to a low. you can also add red chili in the tempering. once the mustard seeds crackle, add 5 to 6 curry leaves and a pinch of asafoetida. stir and then switch off the flame. pour the tempering mixture in the salad. mix very well. if making for family, you can refrigerate the salad and then serve later. add salt before serving as if added earlier, the cucumber releases water. add salt as required. mix very well. serve kosambari salad as a side salad with your meals.